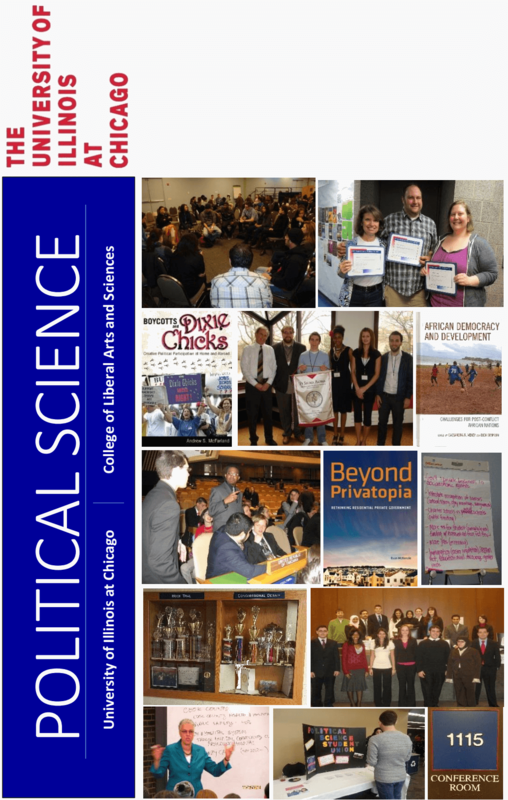 Students in the UIC Political Science Department have a number of program options as undergraduates and graduates. Students who elect this major examine, among other things, the relationships between law and political institutions, economic and political power, culture and identity. They develop the analytical, interpretive and critical methods necessary to understand these relationships at the local, national, regional, and international level. Studying political science teaches students to write analytically, learn to use statistics and data analysis, understand political behavior in organizations, and develop skills in group decision making. Most of our students prepare to follow careers in law, government, lobbying, teaching, journalism, business, and the non-profit sector. Students pursuing the Major in Political Science also have the options of choosing a concentration in Law and Courts or Urban Politics. Several students also combine other majors or minors such as Economics or International Studies. Many students study abroad or gain additional experience through internships and research. Department faculty and staff within the Department host drop-in and scheduled office hours to interact with students one-on-one. We work collaboratively with other units on campus to give our students a broad learning experience.